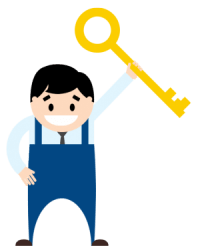 If you have a FAQ for one of our locksmiths, we’ll answer them here for you! We love answering any questions our clients send us. Read our common questions for a locksmith here in this section. I have a key marked "Do Not Duplicate." Can I still make a copy of it? When you open my car door, are inflicting more damage on the lock? Our Locksmiths are trained professionals who use finesse, not force. We can prevent damage to your car by using state of the art technologies. A botched job can easily cause upwards of $150.00 worth of damage to your door panel. Locksmiths should be trained to use dozens of tools so they are ready to open your vehicle properly. Locksmith companies provide high quality installation,repair and replacement services for a variety of lock types. Reputable companies will be able to work with safes, commercial and residential systems, high tech and computerized entry, as well as key responder units. I'm buying a wall safe , what advice do you have? We highly recommend securing your personal data and valuables. Purchasing a wall safe can be the best solution for many people. Look for options that are fire proof and sturdy, and find a suitable location on your property to locate it. Having it professionally installed by a Locksmith technician who can also help you program the electronic entry system is ideal. When should I purchase new locks? When moving into a new home or changing property over to a new owner it is in your best interest to change all locks in order to maintain the highest security. Ask to see their State Government issued Security Employee Licence. Also most reputable companies will list their Master Security Licence numbers on advertisements, websites, etc. I have several children at home that are always forgetting or misplacing their house key. What options would you recommended for my situation? Several lock manufactures offer keyless entry locks for residential customers. Since no key is required to operate this lock, each person is given a unique code or shared code that allows them entry. Most of these locks will auto lock after 30 seconds or so of the door closing, allowing whoever is inside to feel secure that the house is locked. Don’t worry about power failure as all locks will have a key override and a battery backup system to prevent the user from being locked out in the event of any malfunction. A restricted key system prevents the duplication of keys by unauthorized people. The restricted key is only made available from the locksmith that installed the system and can only be duplicated by the person who arranged its installation. A signature and ID is required and the total number of keys made is recorded. This system has been found to be very effective for business security management. Do Locksmiths Work On Motorcycle locks? Yes. Replacement of lost keys and even duplication of existing keys are feasible. In addition, many motorcycles have saddlebags and lockable compartments in fairings that can also require lock service. FAQ https://24hourslocksmiths.com/faq/ 3.4/5 based upon 15 reviews.